Flipping though hundreds of magazines is were some people start when tring to narrow down their design style, but when you do find the designer look you want how do you get it? My favoirite place to start is a website called Houzz.com, they have thousands of interior photos and tons of search filters, so you can only look though photos that your interested in. After you narrow down the look your going for you need to identify what type of materials are in the room, if you cant find these on your own we can help you find what makes it special. The wall and floor tiles are set in an offset brick pattern, notice the change from the vertical shower walls, to the horizontal layout on the floor. 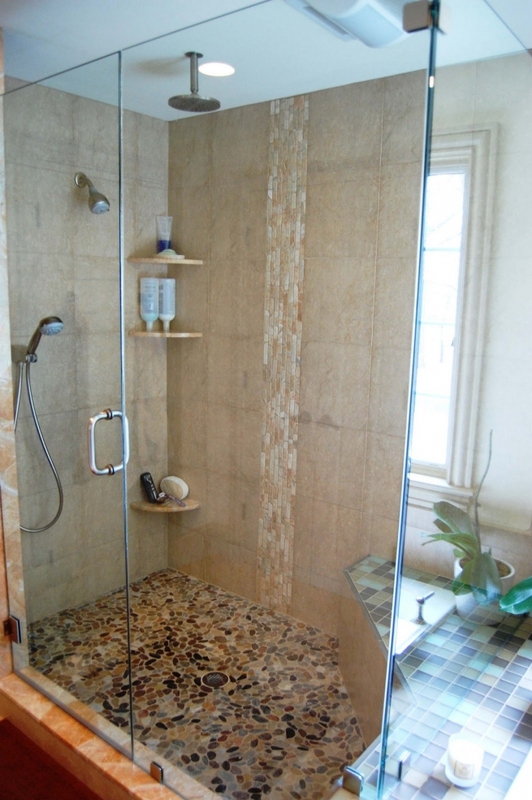 This is done to create a larger looking room and a taller looking shower. I found some tile from Pental that will work for the flooring and walls, its a 12×24 neutral toned tile that looks just like the one in the photo. 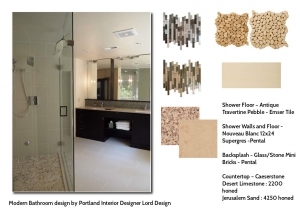 They also have a beautiful backsplash tile called glass stone mini bricks that look very close to the back splash featured in this designer bathroom. For the shower floor there are lots of options but I like these travertine pebbles from Emser they would work in a light or a darker/light mix. Finish it all off with Quartz countertop by Caeserstone with a honed or polished finish. After I identified all the types of materials there are a few other things that should be taken note of if I want to finish this project off with the same ideas to get the closest match. First the dark wood in the room, the contrast between the cabinetry and the overall tile in the room really make a statement, I am going to go with a dark espresso color for my cabinetry and try to incorporate the open shelving below the sink. Next the mirrors, notice they go to the top of the wall and run the full width of the wall they are on, this creates a large amount of refection and gives a wide open feeling to the room. Last tip to get the look is to always remember to personalize the room to make it your own, do this with accessories, pictures and color. Give it a try, send in your photos!